I hope you’re having a blooming good summer! 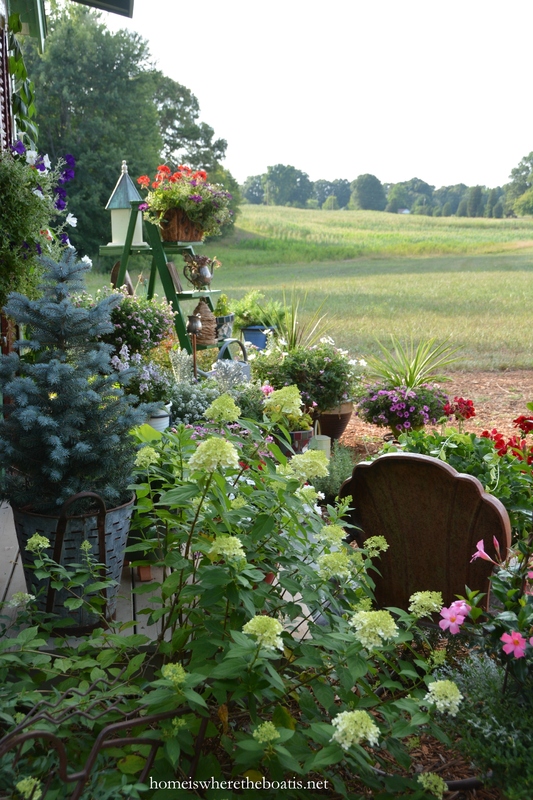 It’s hot and drier than normal here in North Carolina this summer, so I’m watering pots around my Potting Shed every morning. It’s apparently the perfect weather for Passion Flower! 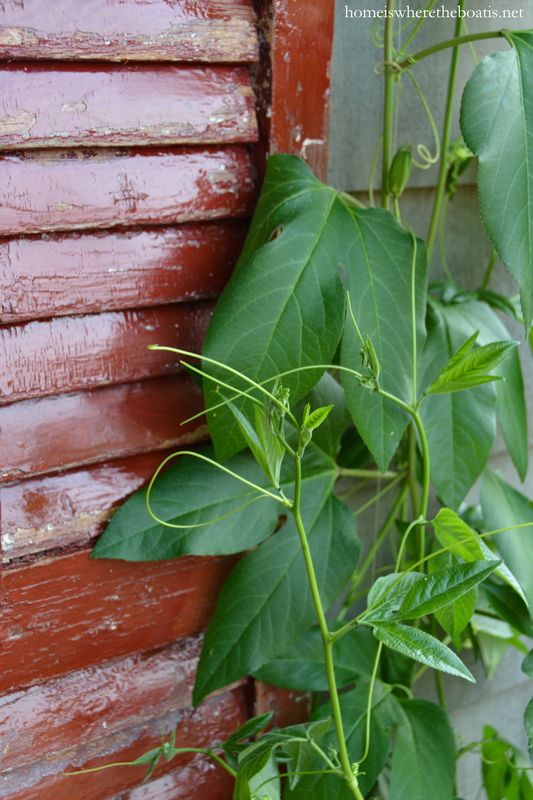 This vine volunteered and has grown up from between cracks of the boards of the porch of my Potting Shed. I attached some fishing line to my shutter for it to climb. It’s grown 10 feet in about a month and I’m anxiously awaiting the blooms. 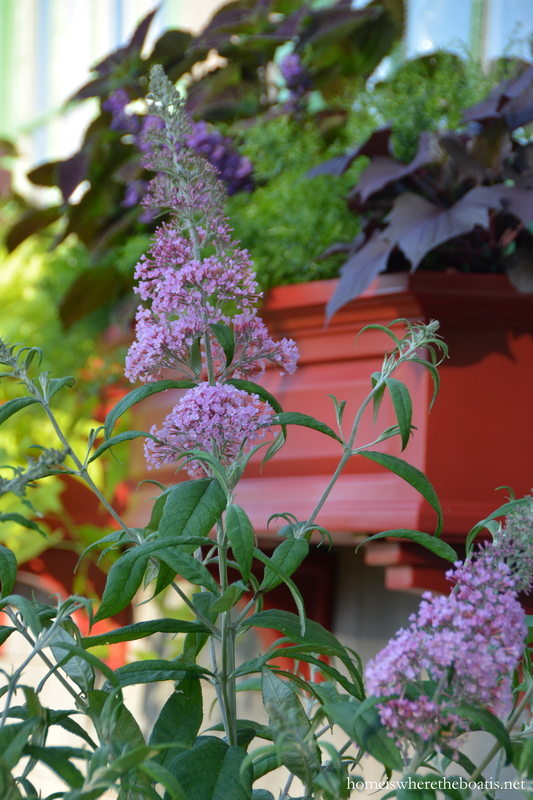 My shed faces west and gets the hot afternoon sun, so I chose some plants that were heat tolerant. Mandevilla likes our hot and humid weather. 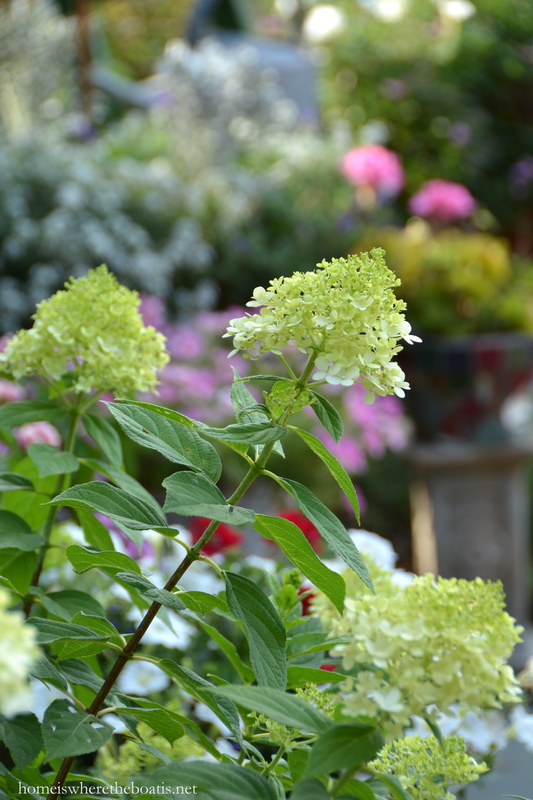 . .
And Limelight hydrangea is starting to bloom and is drought tolerant. My window boxes are filled with an assortment of sun-loving and heat tolerant annuals. . . They have a double wall design with a water reservoir so they’re self-watering and one of the few things I don’t have to water everyday. 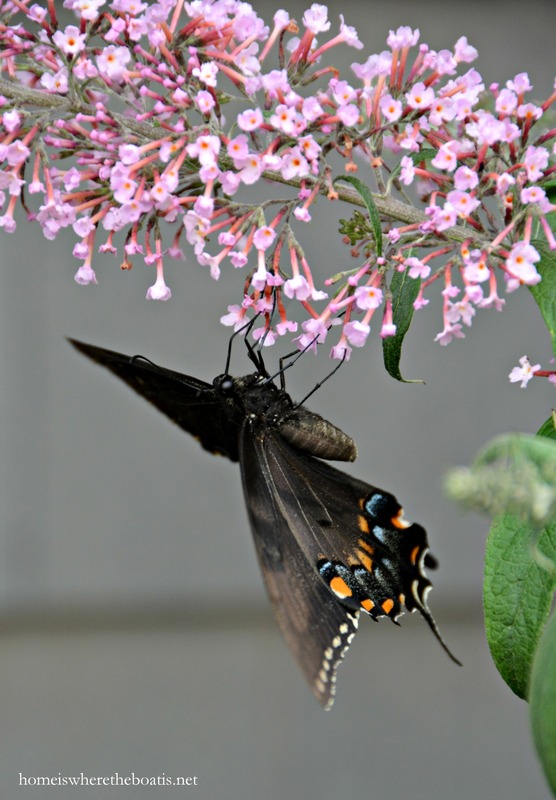 And butterfly bush can handle the hot, dry weather and is attracting butterflies. 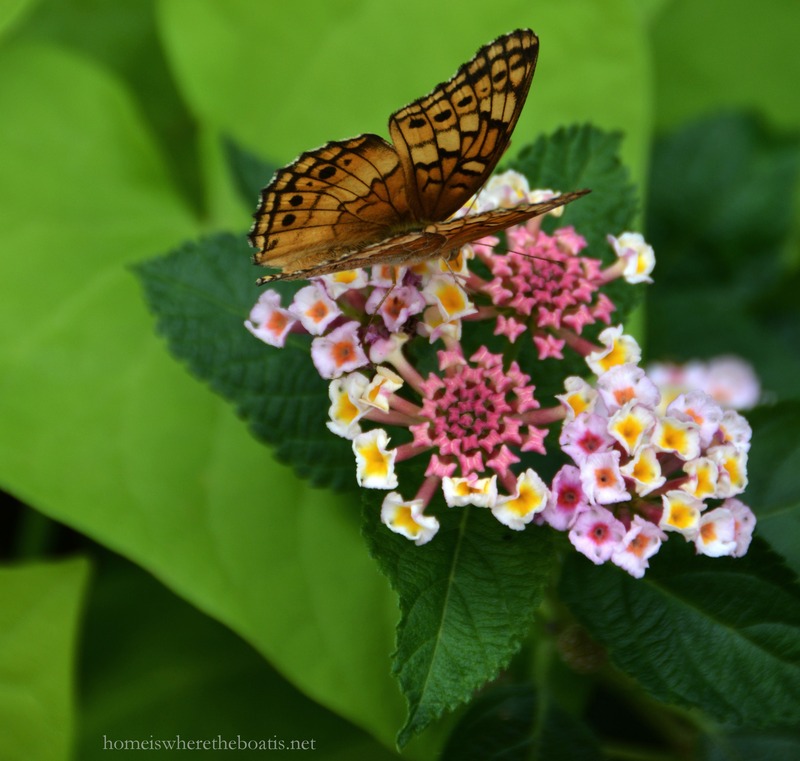 Along with lantana which provides blooms for nectar lovers and can stand the heat. Hen and chicks are low-maintenance and require little water. They are nesting in this boot planter that flew home with me from HomeGoods. Hope you’re beating the heat and staying cool in your nest! Your flowers are so beautiful and don’t you just love it when something appears through a crack someplace? A gift from Mother Nature and she knew just where to place it! I like the Blue Spruce in the Olive bucket as well. Hope you are enjoying your Summer! 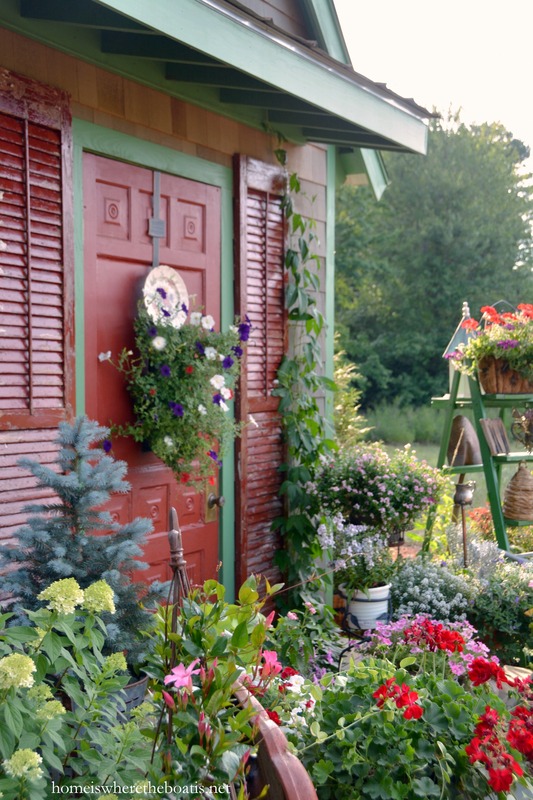 Enjoy the ever-changing look through the seasons of your darling potting shed display. 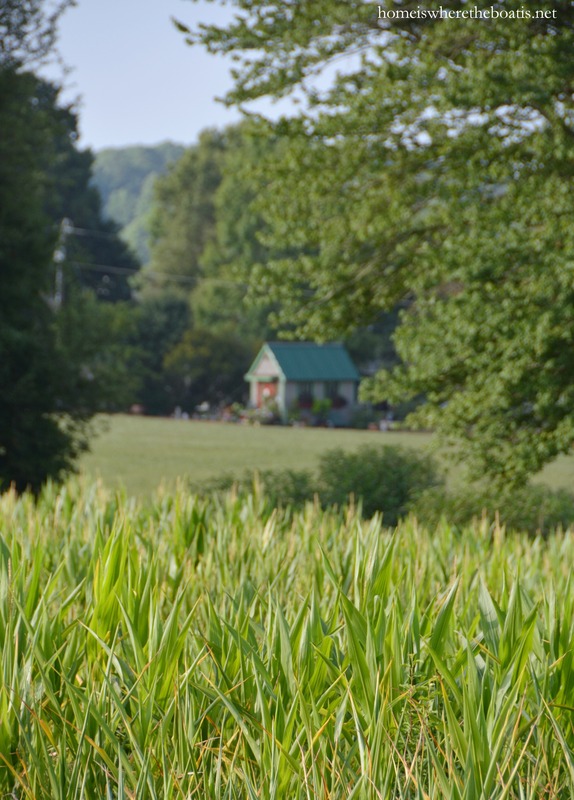 Each growing season brings with it unique challenges. For NW Illinois, we experienced a very dry & hot summer similar yoto your conditions at present. This year the challenge is trying to keep potted plants and waterwise perennials from drowning! 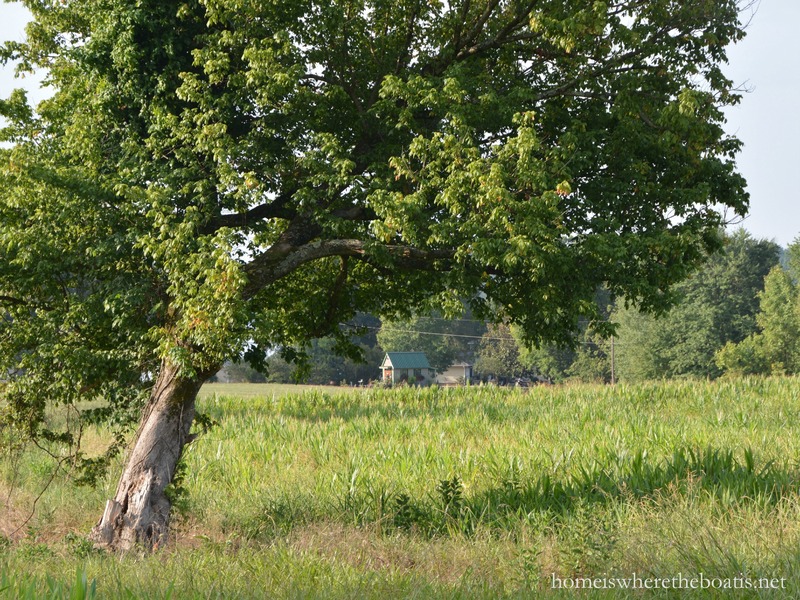 Mother Nature certainly has a way to keep us gardeners on our toes! Your flowers are looking great Mary! I’m sorry you have to water everyday, hopefully the heat wave will subside a bit or you get some rain! its all so gorgeous!! Our flowers and veggie garden are suffering with our heat and water restrictions. 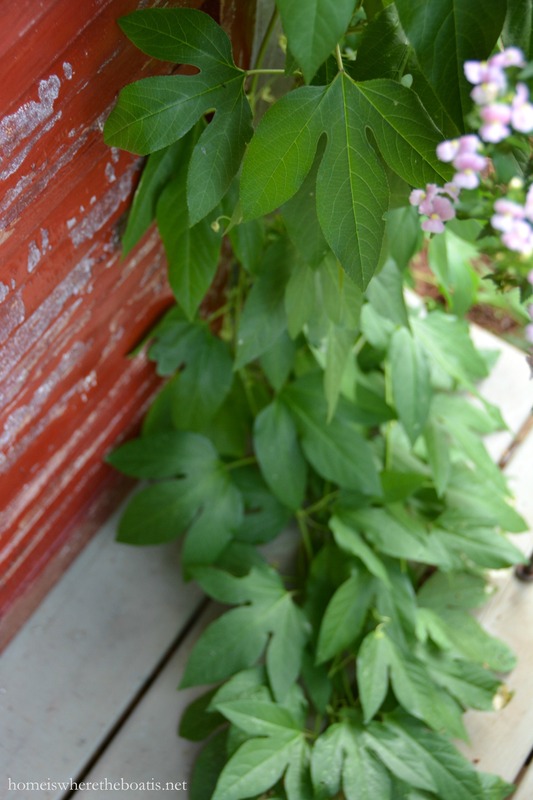 Your potato vines in the window box are thriving and everything is filled with summer color, love it all. I invite you to share at mu Thursday hop. Hugs! Hi, Mary! 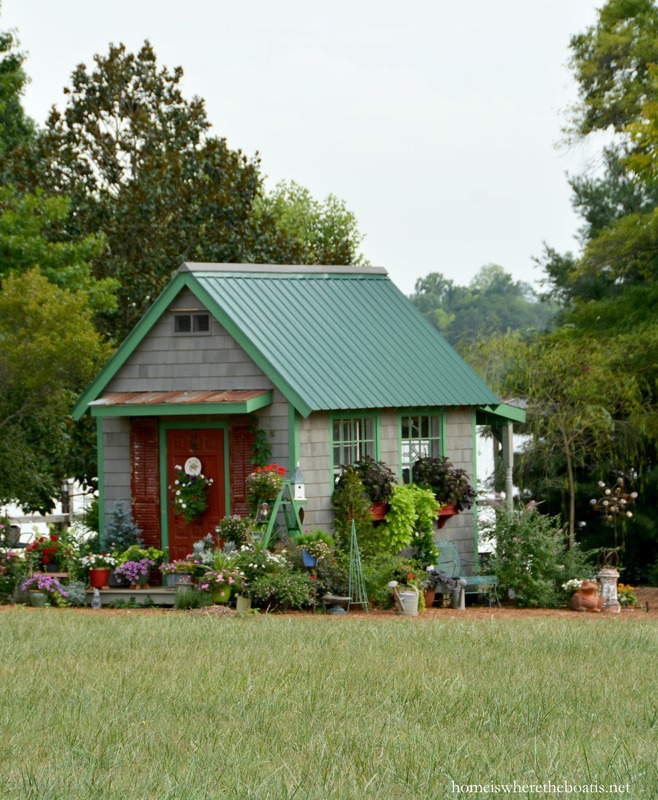 Your shed looks charming and colorful this summer! I showed my hubby your gorgeous photos and he was very impressed by the color and quality. We know the talent of the photographer is the key to great photos, but would you mind sharing what kind of camera are you using these days? Thanks! We’re happy to be back from our holiday and looking forward to your posts! Many thanks! I gave hubby the information, and I sense a purchase in my (very near) future. Have a great day! I know all about daily watering, Mary. 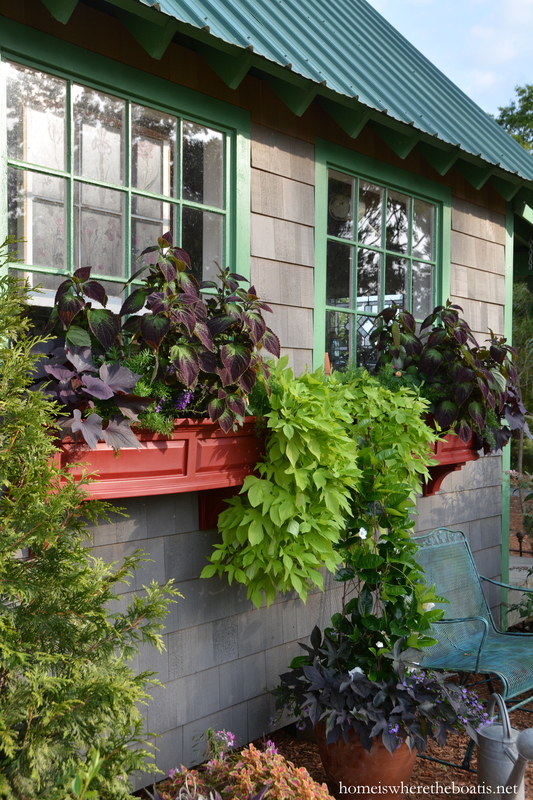 My favorite potting shed looks perfectly happy amongst all the pretty plants. 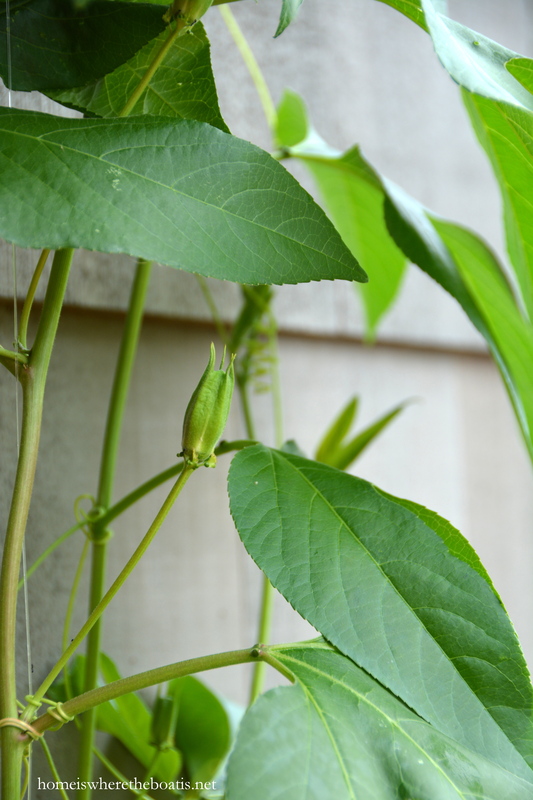 I look forward to seeing the blooms on your passion vine. 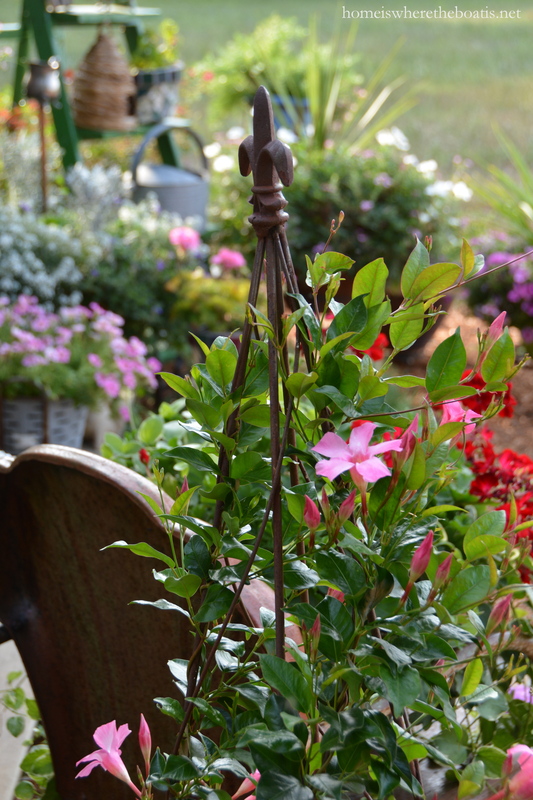 I have a mandevilla vine, also, but not many blooms. It’s grown beyond my fence, though. 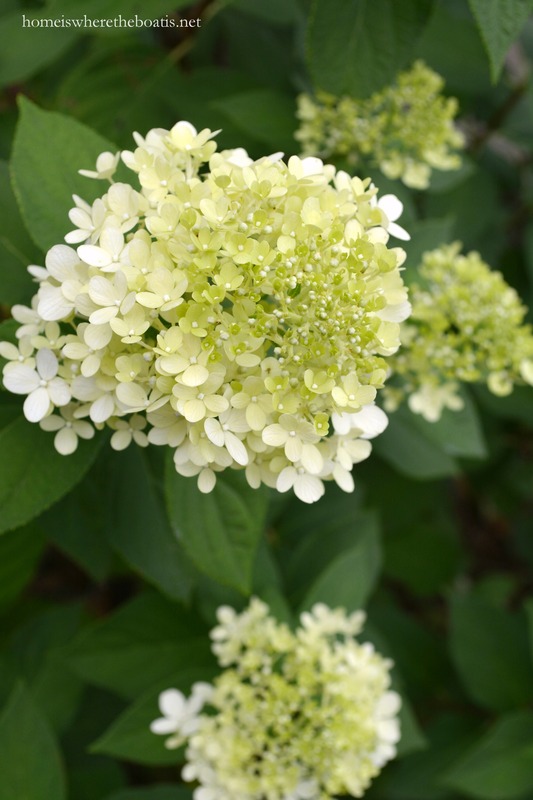 Your limelight hydrangea is one that I’d like to add somewhere. 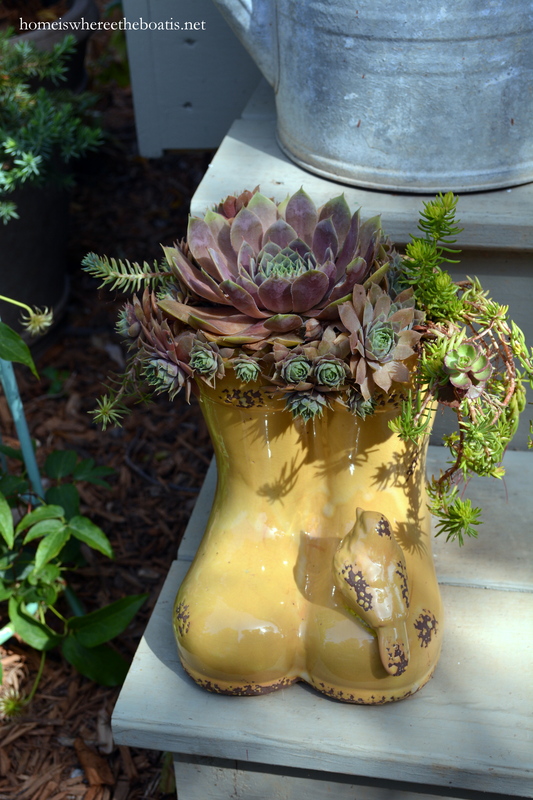 The hens and chicks are so cute peeping out of the boots. There are happy surprises around every corner. 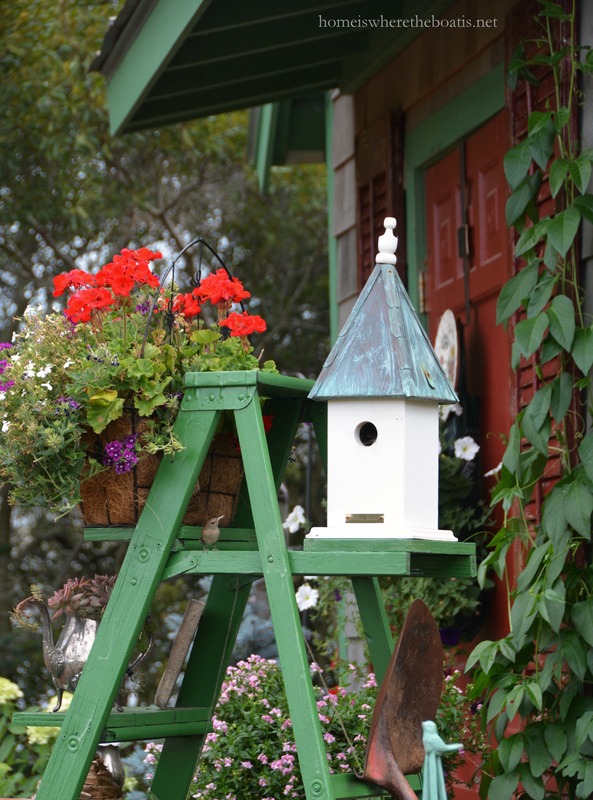 Your potting shed flowers are just beautiful and love the little friend peeking out of her home! I live in WV and we are watering just about every day here too! But it is worth it for sure! Have a great day and always look forward to your posts! Much needed rain and an amazing thunderstorm just came through. What a joy to see all of the lovelies in your site. I, too, have a limelight and love how it turns pink later in the season. It dries beautifully as well. Sweet little friend peeking out of it’s borrowed home is so precious. 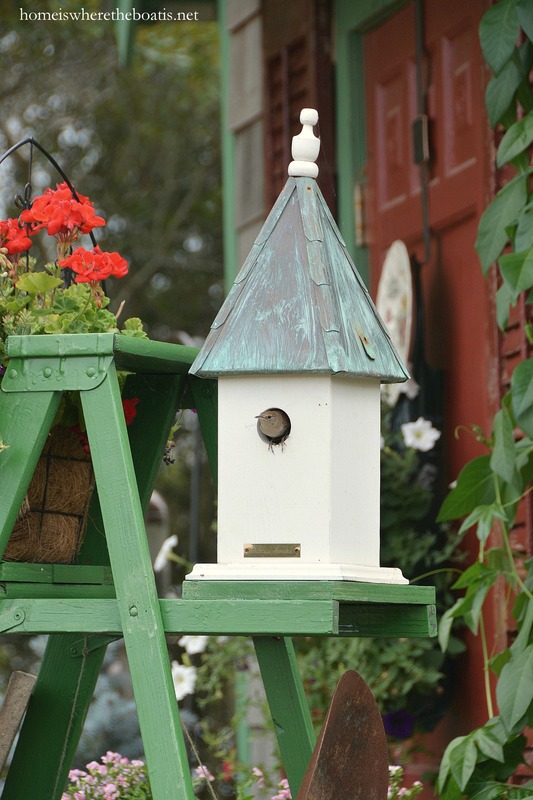 Thank you for sharing your happy garden shed and all of its treasures. Oh I just love it when a plant “volunteers” and shows up unexpectedly! [really, the only kind I can grow :) ] No doubt that vine wanted to join all the blooming fun always going on around your potting shed Mary! You have obviously been working very hard in all this heat to keep everything so happy, the whole scene is just bursting with happy! 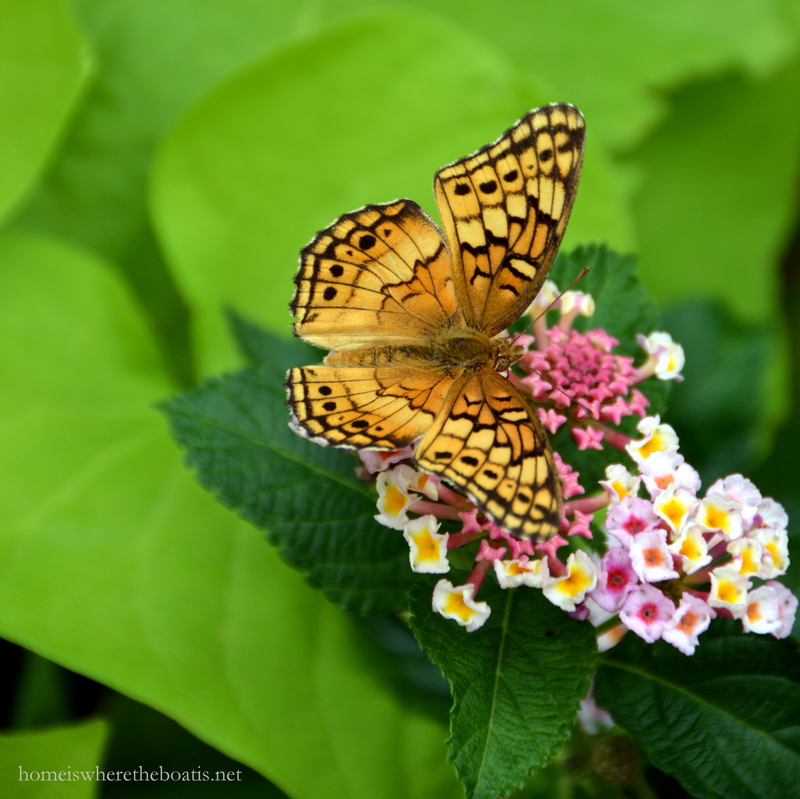 Mary beautiful photos and the butterflies are so pretty. Poison ivy is sneaky. This is just so gorgeous! You have a wonderfully green thumb, a great eye for design, and some terrific photography skills! So enjoyed looking around your potting shed, how very beautiful! 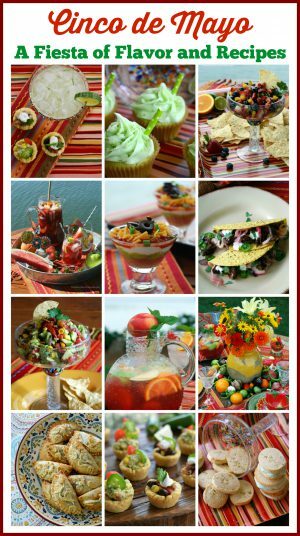 Such an abundance! 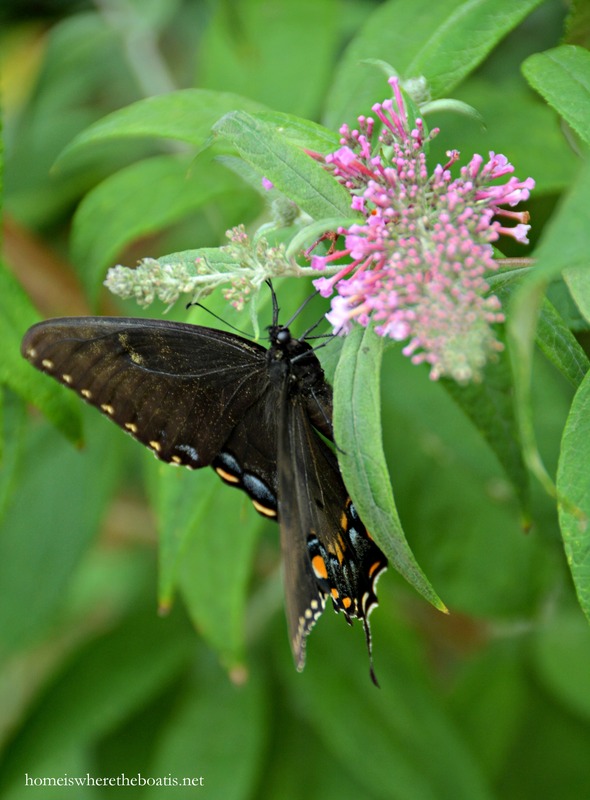 And love your photos, especially the beautiful butterflies. Wow, gorgeous photographs, lovely flowers! *giggles* I just got a glimpse of your little fat frog on the corner…he is too cute! LOVE the limelight hydrangeas. 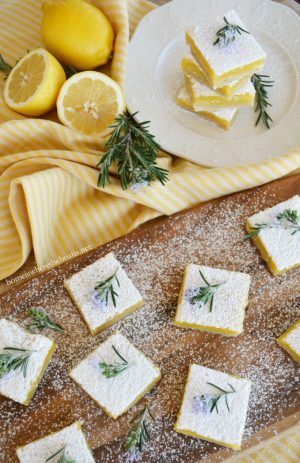 They are a favorite of mine! 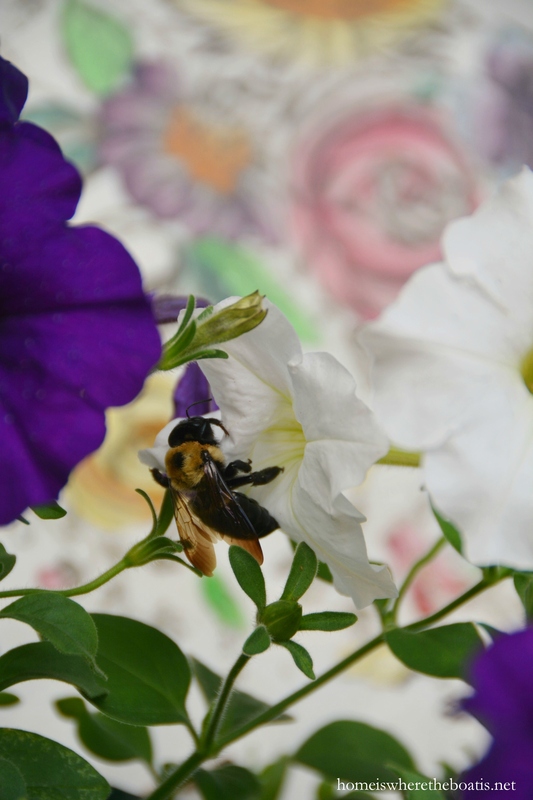 AWESOME bee photo…. Just gorgeous, Mary!! I love every image and especially the long shots. 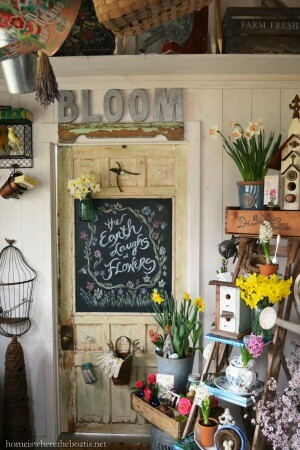 What I wouldn’t give to have a potting shed like this! 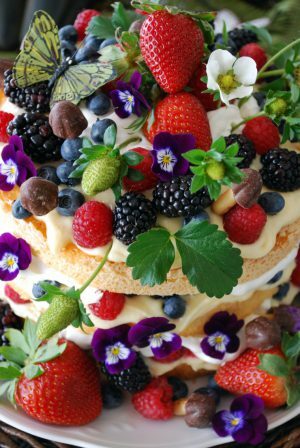 That said, I got some great ideas for potting plants and flowers from this post. 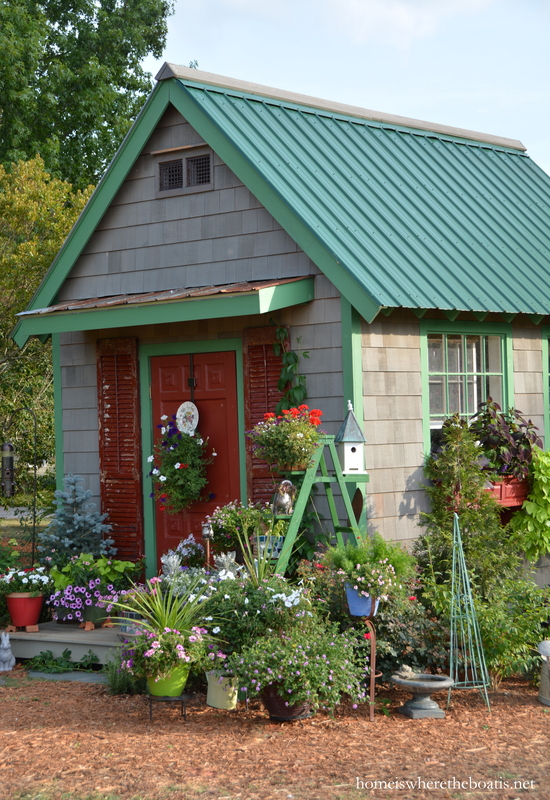 Your shed is just lovely! 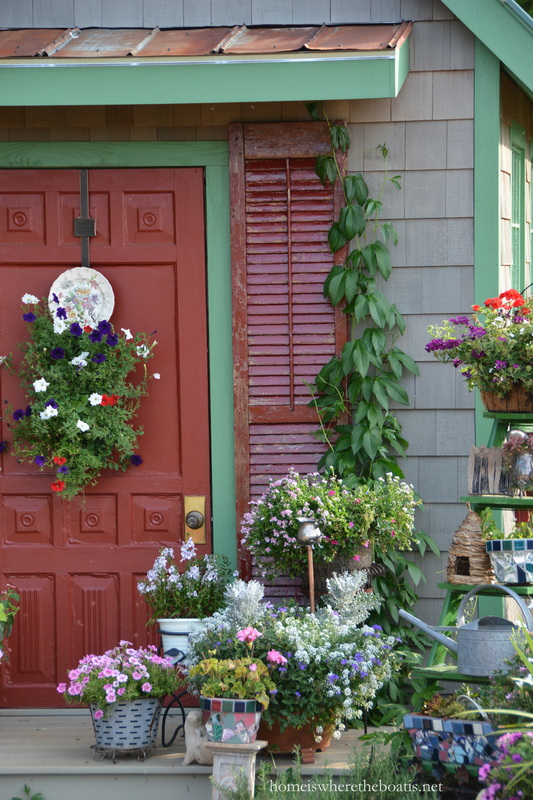 Oh my, oh my, oh my….jaw dropping, drool worthy gorgeousness around the shed!…You are amazing with keeping your plants and flowers so remarkably beautiful with this heat….you are the master stylist inside and out!…Beautiful, beautiful!….The window boxes look fantastic! Absolutely lovely photos. Love the butterflies especially. Beautiful! You have given me many ideas for landscaping around our shed now. I want to make it as gorgeous around ours as is yours. Thank you for the inspiration!